Matching or non-matching wedding rings? 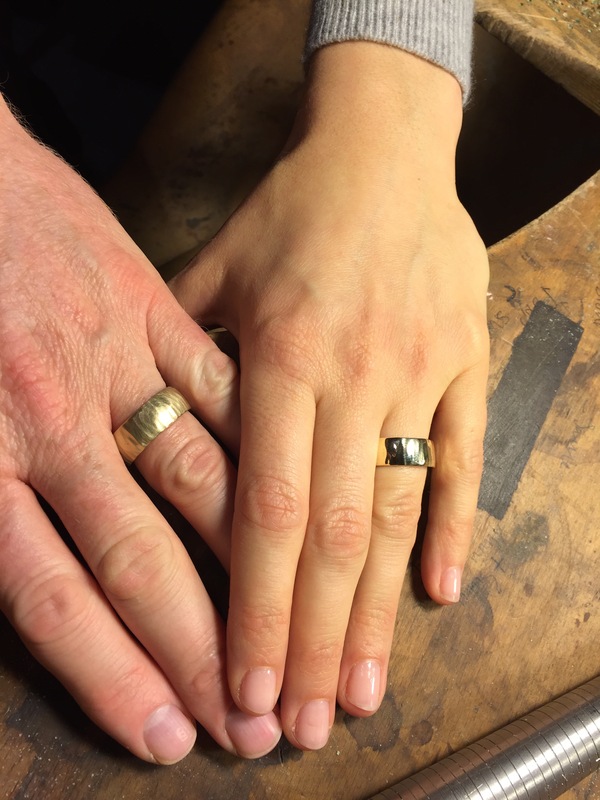 Most people who come to the studio to have wedding rings handmade are choosing non-matching wedding rings, but often like to have the same colour and carat of gold, tying the two designs together. I think it’s important that each person chooses a ring that reflects their own taste and individuality as well as signifying their union, but a lot of people do ask if this is the norm. Obviously the type of people I make rings for are looking for something unique to begin with so they are less likely to opt for a traditionally matching ring with their partner. 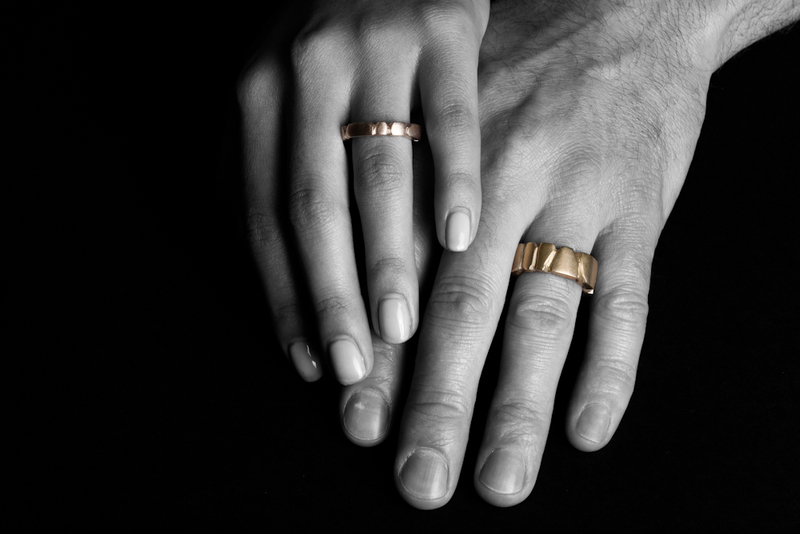 One option for couples who would like similar but non-matching wedding rings is to choose a unisex style that can then be hand-finished differently (such as the Ripple style wedding bands above – both in 14 carat gold but finished in both a mirror polish and matte brushed finishes). The two rings below are wide white gold heavyweight comfort-fit bands, both set with square diamonds, but one set on end and the other flush with the edges. Couple this with a hand-hammered finish to one and a bright scratched finish to the other and you have two similar but very different rings. Other times both partners will decide on the same ring but choose different proportions. Again, often it is not unusual for the woman’s ring to be much larger than the man’s as it is simply down to taste. 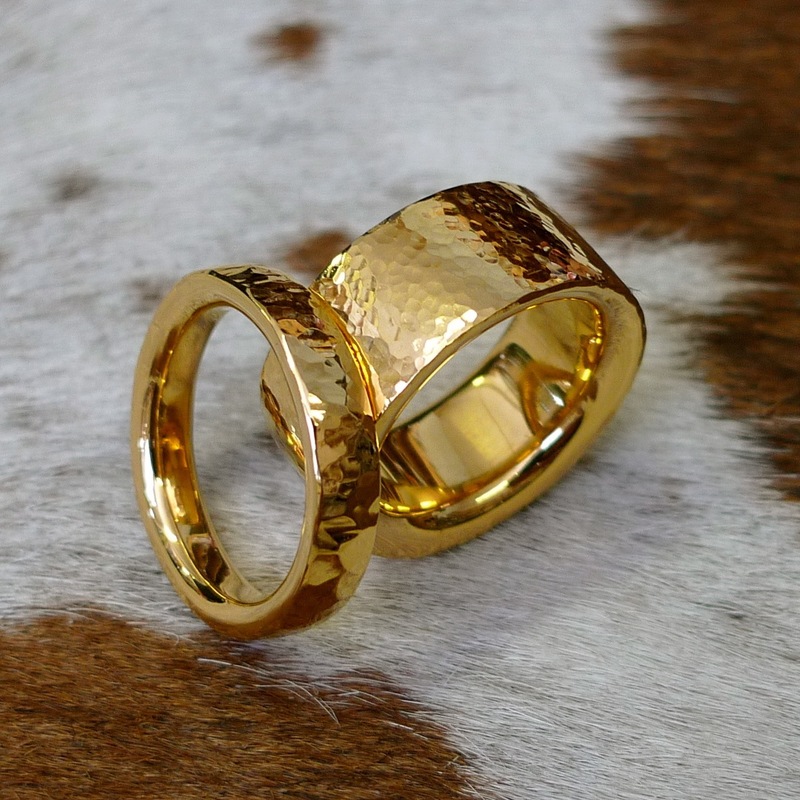 Below are two heavy yellow gold Ripple rings. I call them that as the finish looks like moving water and is a lovely alternative to a hammered finish but still bounces light off the surface creating interest. 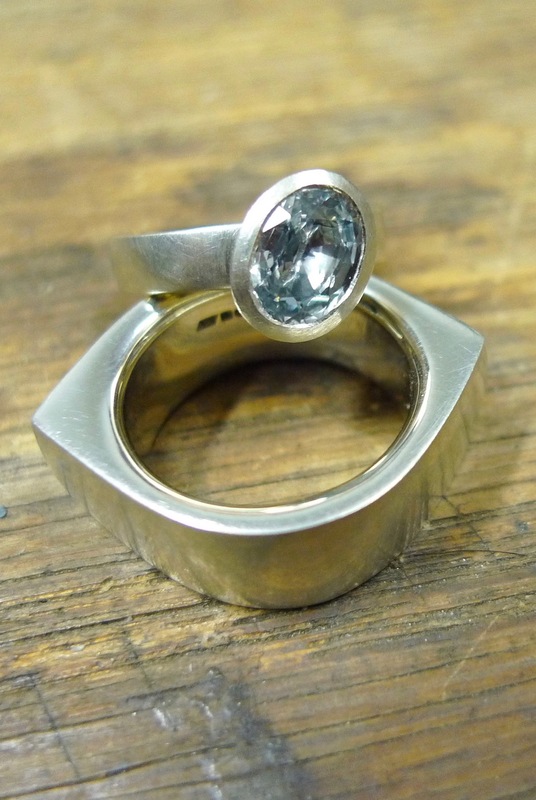 I have made this style of ring in lots of different proportions to suit all hand types for both men and women. It has a comfort-fit shape on the inside and a slight curve on the outside with deep smooth ripple texture. The ring shown here is about 10mm wide and 3mm thick but I have made it 15mm wide and 2mm thick and 4mm wide and 3mm thick so really the design can be worked into any scale without losing impact. Here we have a green sapphire in raw white gold which a client chose from a selection of coloured sapphires in various shades ranging from grey to violet to yellow. By choosing to combine her engagement and wedding ring we were able to create a lovely alternative to the traditional two rings as the width of this ring allows a far larger stone than if she had chosen to have separate engagement and wedding rings. The shank (body) of the ring is shaped into a flat edged comfort-fit style which means it tapers from the inside of the ring to the outside edge. This is incredibly comfortable as it allows for any swelling of fingers when the hands get warm ensuring the ring will never dig into the finger due to the curved inner edges. The white gold was left raw and un-plated to match her fiance’s ring which was a super heavyweight eye-shaped solid 9 carat gold ring. 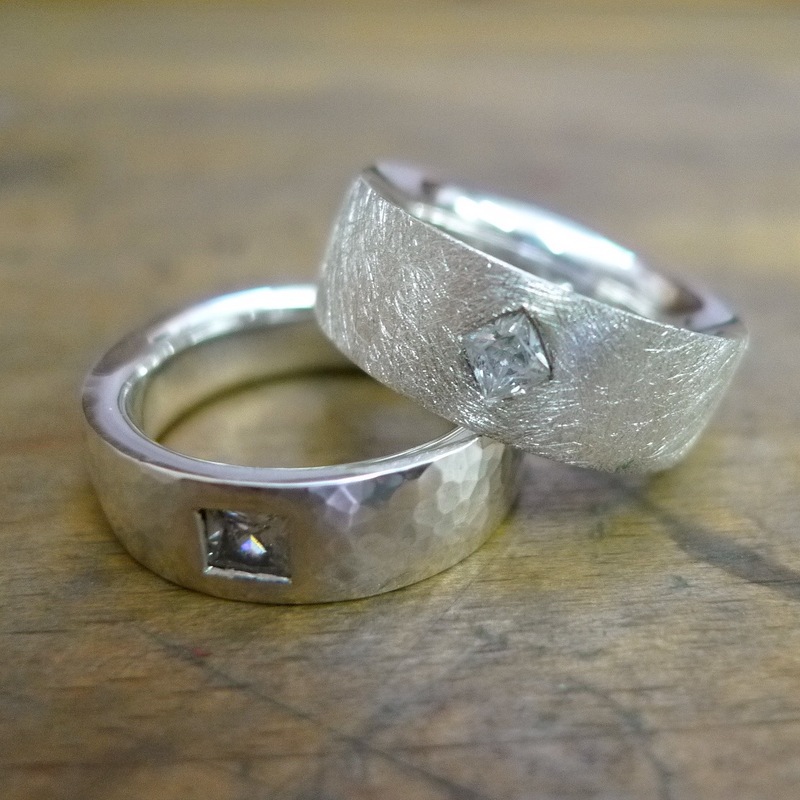 Both these clients are designers and wanted something beautiful and different reflecting their own personalities but sharing a common theme, in this case the raw matte white gold. White gold is traditionally rhodium plated to give it a mirror shine chrome finish which I tend not to use on many of my designs as the slightly yellower tones of the raw white gold really suit cool coloured stones adding a touch of warmth. However, if you are after a cool mirror bright finish then rhodium will provide that and provide a long-lasting surface before it will eventually need re-plating. Most white gold items you see on the high street will have rhodium plating. Both the above rings were carved in wax and cast in white gold. I always hand-carve ring shapes as you can get a terrific weight into designs which would be impossible to recreate by hand-building a ring. The man’s eye shaped ring above was extremely heavy but by ensuring the fit was perfect the ring felt really comfortable to wear. I have made many eye-shaped rings in silver which would weigh in lighter than gold but over time the gold will retain a much better finish due to the hardness of the metal. Below are two rings from my Faceted collection – hand carved in wax and then cast in rose gold for her and yellow gold for him. Another example of how the same design can look completely different but at the same time the same just by altering the scale. When making these types of rings it is very important to get a perfect fit at the wax model stage as due to the deep texturing they are difficult to alter in size once cast so I carve various models to ensure the client is happy with their choice and the fit before we proceed.